To practise with one partner. This is usually the way for beginners and uses the forms as laid down. Once you understand the basic form then try to add more movement to it. The next stage is for three people to practise. This gives two students against one so as to provide a more continuous practice and teaches you to react more quickly to the attack. Sometimes practise gently - other times practise hard. When I say hard I do not mean with strength but by non-stop practise with your partner making strong attacks on you continually. When attacking, make sure that your attack is true. Otherwise, you give your partner a false impression and this will not help him one bit as it will give him a false sense of the movement. If your partner cannot escape your attack then it is his responsibility. Do not get upset if your partner catches you off-guard. Just put it down to good experience. Next try three people against you with all three attacking you at once. Do not try to make correct techniques but keep your body moving and turning in a circular motion, trying to keep your mind and body relaxed. 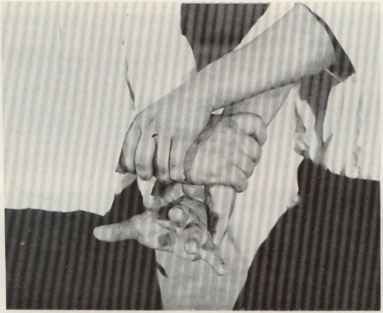 Another method practice is for two partners to hold you and for you to try to escape. This practice will show whether you are using strength or not. In the beginning always let your partner hold you but as you progress you should move just before they touch you. Lead their strength with yours. 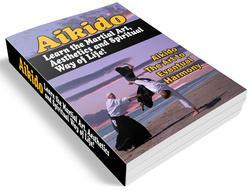 Do not let your Ki power clash with your partners or you will not feel the real sense of Aikido.